Kevin and I headed out Friday up Ward Mountain. I had an obscure tour in mind that was all new and we were pretty excited about that. We summited Ward after 3 hours and with a shallow cloud hovering over the summit we began our first descent of the day down the south face of Ward to Camas Lakes. Ward being a large rollover it was tricky trying to find the exact line I was after and we erred a bit left into a good alternative descent line. 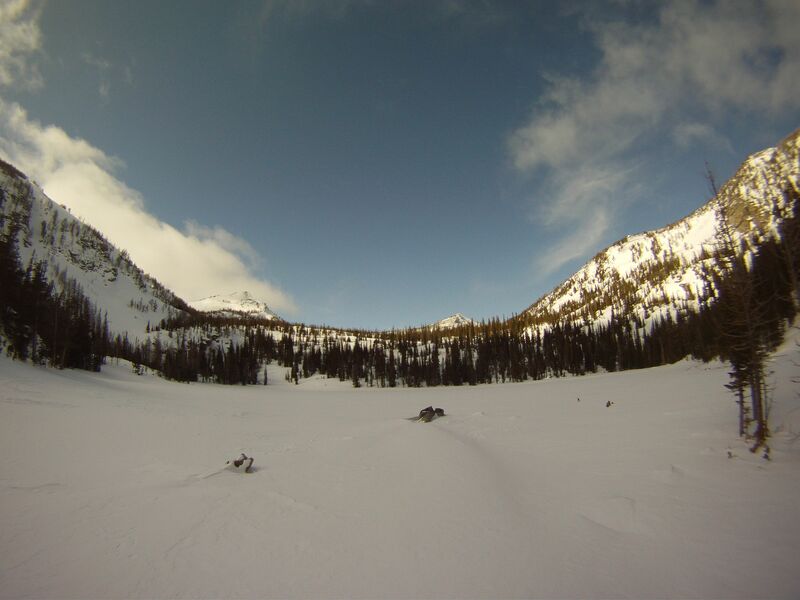 We arrived at the second lake intact and under a glorious sun. The views of Camas Ridge on the descent were spectacular and we took note of the two nice looking gully runs to the west of the main summit. We ate and began touring up canyon. I was counting on water, but we found no more than a stagnant looking pool. I believe between the first and second lakes would have been some open water but we were not headed that way. Next time I will detour. Climbing to the pass between Ward 2 and 3 seemed like the best way to approach Ward #2 on the map but as we skied by it looked like a rocky, cliffy summit ridge so after making it to the pass we backtracked/traversed east to a firm snow patch and began bootpacking. From the summit of Ward #2 the views of both Ward Mountain and Ward #3’s east face were really good showcasing Ward’s alpine west face and Ward#3’s great ski lines. 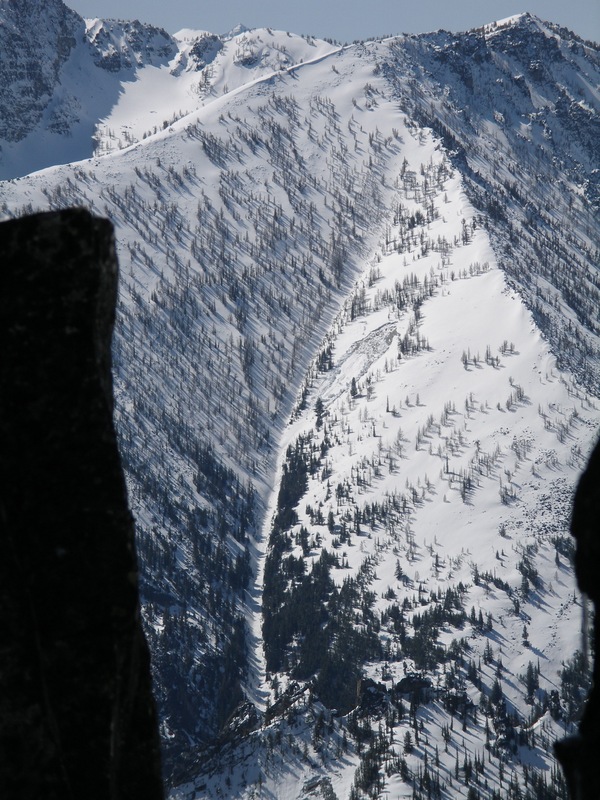 We ran a long descending traverse to the north end of the ridgeline of Ward #2 and skied up to the edge for a look at the White Stripe entrance. Not bad, we had a short descent climb to make it through some talus before getting to consistent snow where we strapped into the skis for the 3,600′ vertical descent. Aptly named the ski line starts a s a small snowfield and then descends into a perfect concave gully run for 3/4 of the descent. 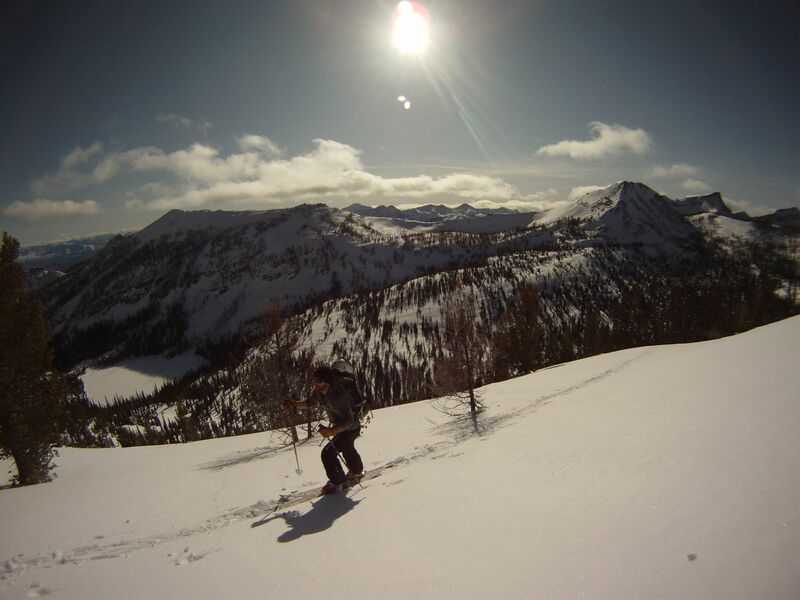 With good settled powder, we encountered no sluffing or instability and skied the run to the choke with only one stop. With good glade skiing on both sides of the upper gully there would be room for a few people to ski this line but the ensuing gully was really just perfect for the two of us. The choke consisted of two icefalls only the lower one which may have been skiable. We bypassed both on the left ridge and then into a second gully. From here the breakable crust and brush was substantial, so we whacked out of the gully to the east below the cliff band and skied the talus slope to the creek. Roaring lion had only a set of Coyote tracks and maybe a small Moose in it. With its rambling uphills and occasional steep descents it is no fine trail ski. But we were back at the car in an hour or so celebrating with Olympias. 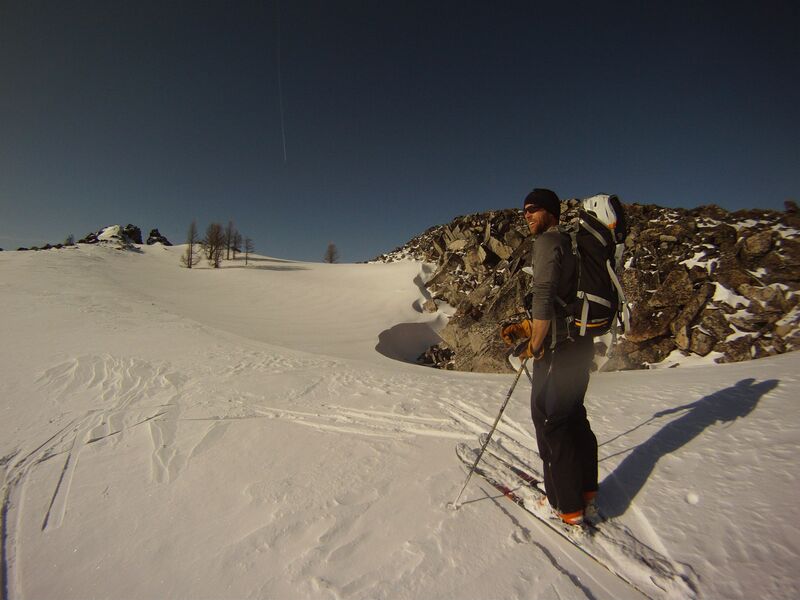 Another great backyard exploratory ski day- 6,500′ vertical and 9 hours with a great new terrain feel to the tour. 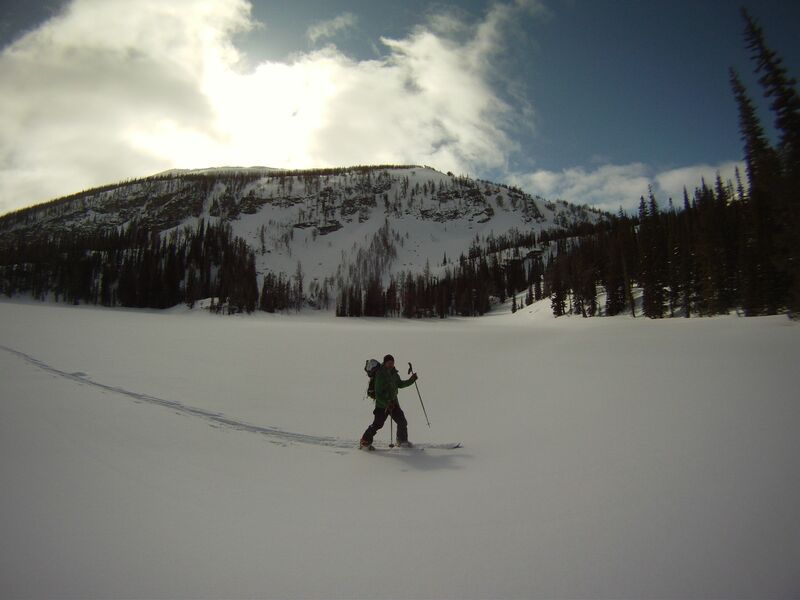 Last Wednesday, I had the good fortune to team up with speed skiing artist, Brian Story for a wonderful trip into the Bitterroot Mountains. We toured up and over Little St Joseph Peak finding fast travel on a set skin track all the way to the summit. Descending the ensuing ridge through a krumholtz forest and along the ridge had its tricky moments, but persistence pays. We traversed the top of the long north facing run into Sweeney Creek and after crossing the subridge into the main basin below Big St. Joseph Peak we started our descent into South Sweeney Creek. 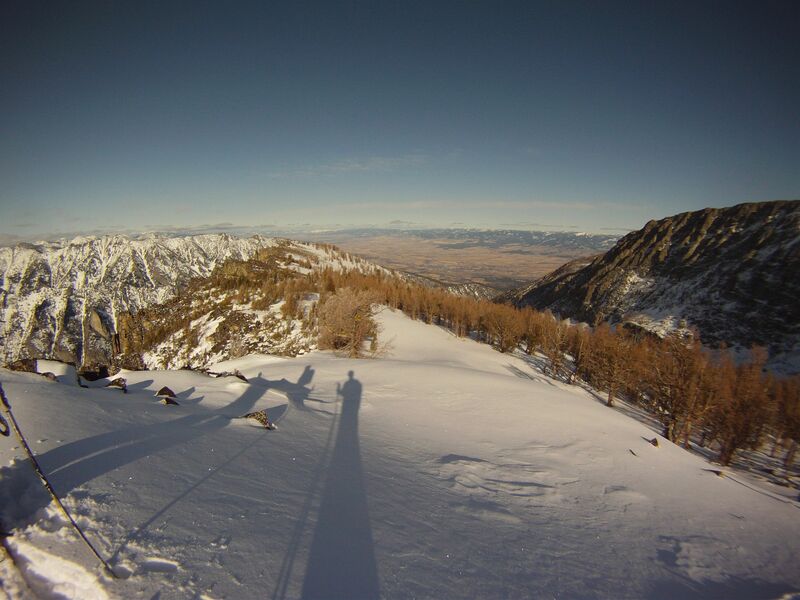 The skiing was good with nice sheltered north facing powder which we enjoyed for many thousands of feet to the canyon. 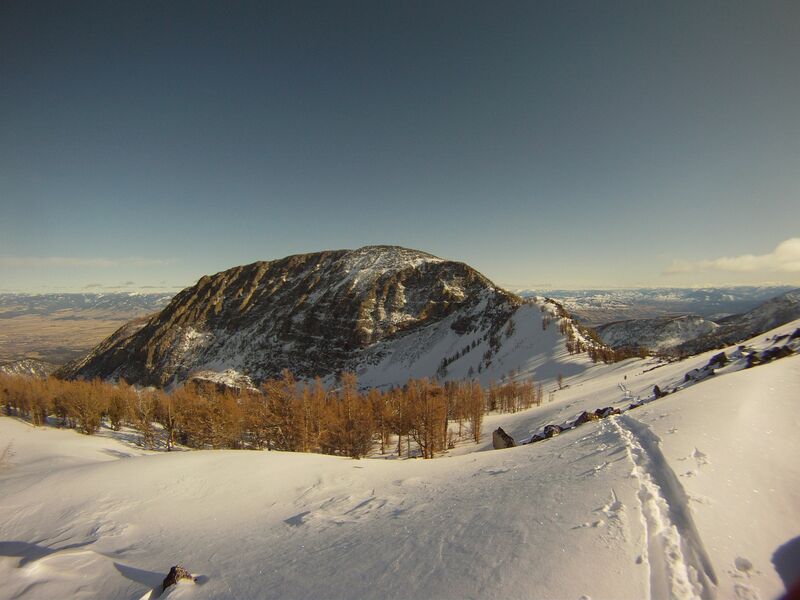 After skiing a thousand foot avalanche path, we headed west towards the bottom of the East Pyramid and after crossing the creek where we watered ourselves, began the hour long skin to the summit in hot sun at first. 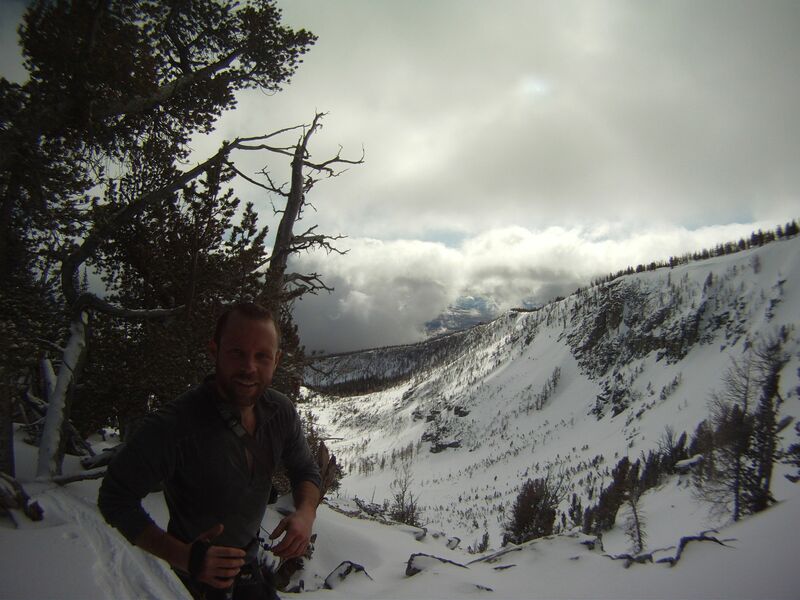 After half of the climb the wind blew harder and the clouds rolled in to obscure the sun and harden the softening snow. We reached the summit around noon and after a short break to admire the nice views of the upper Sweeney Creek basins,including Big St Joe and Sweeney Peaks, we began the descent. After softening for part of the morning the snow had refrozen into a manageable and shallow breakable crust and we skied a beautiful line punctuated by an impressively vast upper snow face, smooth and even, followed by a gully that became tight and constricted and with some small avalanche debris, to a open apron depositing us at the bottom of the run. I had remounted my K2 Sahale 174s and struggled with their desire to hold a line if I ventured backseat at all. Brian looked much better on the Dynafit Broad Peaks 167s and schooled me on this descent. Afterwards, I rested and began breaking the trail back up and over the St Joe Ridge, while Brian tackled another shorter gully run to the east of the Pyramids. At the top of the bootpack, I looked down and could see Brian below moving fast, so continuing slowly until the slope moderated enough to skin, I waited there for him. Light snow had begun to fall as we began the final descent to Bass Creek via the Pin Ball Wizard gully. 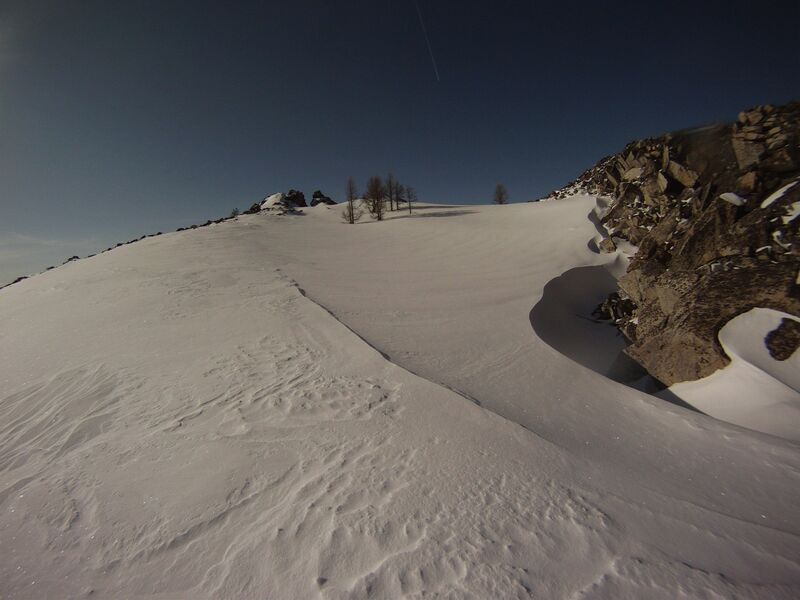 It had avalanched and left a very smooth and hard bed surface which was fun and fast to ski. From the summit ridge to the car took less than an hour where Brian distributed the IPAs and we enjoyed some conversation before heading home. It was my longest day of the year with over 10,000 vertical and Brian tacked on an additional 1,500 or so.